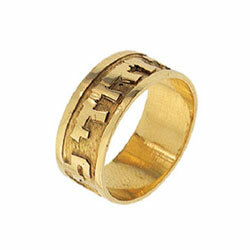 Hand crafted and Custom-made bordered 18K Gold name or wedding ringring with Hebrew letters. You choose: size and phrase for no extra charge. Florentine finish with shiny letters. ( "I am to my beloved and my beloved is mine")"Ze Dodi Veze Re'ei" (This is my beloved and this is my friend. )"Ha'ahava Hi Mekor Hachaim" (The love is the source of life. )"Matzati Et She'ahava Nafshi" (I found him, whom my soul loves. )"Ba'asher Telchi Elech" (Where you will go, I shall go. )"Ahavat Olam Ahavtich" (I Have Loved You with an Ever Lasting Love. )"Simeni Kahotam Al Libcha" (Put Me Like a SEAL Over Your Heart. )"Tihye Nafshi Kshura Benafshech" (Let Our Souls and Spirits Interwine. )"Betseti Likratcha Likrati Metsaticha" (when i go forth to find you - i find you seeking me). "Gam ze ya'avor" (This also will past). "Betach Bahashem Bechol Levavcha" (Trust in the Lord with all your heart)"Ani Uveyti Naavod Et Hashem" (As for me and my house, we will serve the Lord)"Yevarechecha Hashem Veyshmerecha" ( The Lord bless you and keep you)"Hashem Roi Lo Echsar" (The Lord is my shepherd, I shall not want)"Hashem Ori Veyishi" (The Lord is my light and my salvation)" Yadati Machsavotai Aleychem" (I Know the plans I have for you)"I want to use text of my own"